Mediterranean Sea From the Latest Surveys. A rare and extremely attractive nautical map of the central Mediterranean Sea issued in 1868 by the British Admiralty. Covers from Corsica, Sardinia and Tunisia eastward past Italy and Sicily to detail Greece and the Adriatic Coast. Extends southward as far as the Gulf of Sidra. 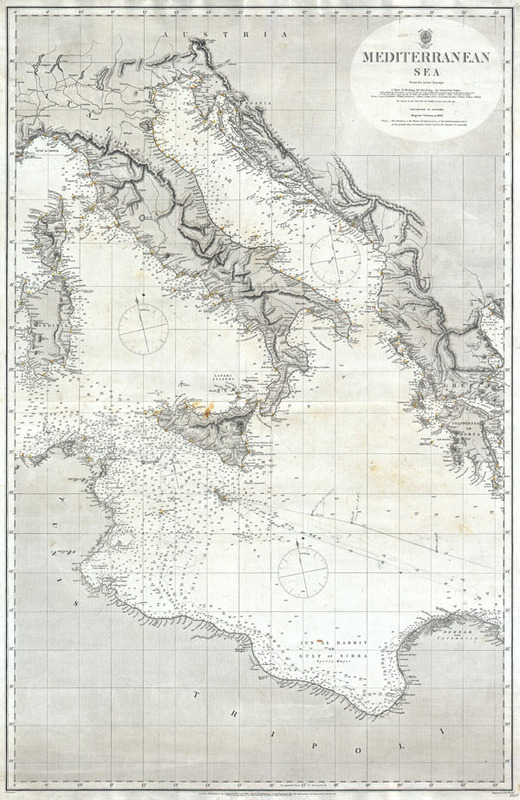 Features both nautical and inland detail noting both topographical features and thousands of depth soundings (in fathoms). Important ports, Island and navigational points are carefully noted. Engraved by J & C Walker for the British Admiralty under the supervision of Captain Washington R.N. Originally sold for half a crown by J. D. Potter, of 31 Poultry & 11 King Street Tower Hill, London, Agent for the Admiralty. Very good condition. Minor soiling. Light pencil marks indcation use as a navigational chart. These could be easily removed with a light eraser, but we have chosen not to because we find them interesting. Minor brown spot in northern Sicily.